Weybourne parish sits on the northern coast of Norfolk just west of the twin coastal resorts of Sheringham & Cromer. Marking the point where the sandy cliffs to the east become the shingle-bank protected saltmarshes it is a justly popular area with visitors keen on walking the cliff tops and sighting the numerous birds found in the diverse habitats. In the past Weybourne took an equal interest in the sea and the land, as can be seen with the mixture of occupations of the fathers in the transcript. Of interest is the regular series of baptisms of coast guard (preventice service) men, most deliberately strangers to the local area. 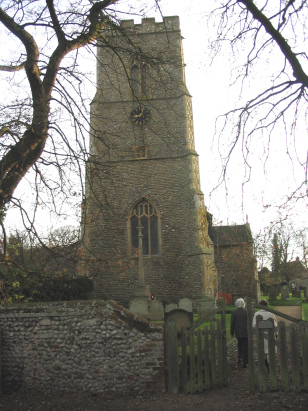 All Saints church sits in the centre of the modern village adjacent to the narrow, traffic-congested coast road. 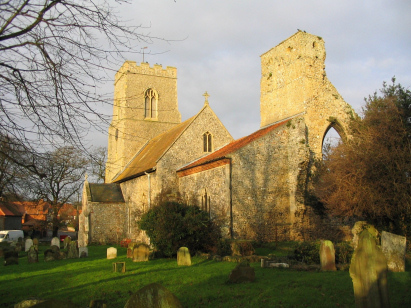 The church was established amongst the Augustinian priory established at the end of the 12 th century. It is now difficult to determine the floor plans of priory and church as they are interwoven. Most of the present building being adaptations of an earlier monastic function, it is difficult to assign an overall age and style. The records in this transcript were prepared from Microfilm MF1410 in the collection of the Norfolk Record Office. This filming is quite recent and the images are clear and with good contrast throughout. As usual there are reservations regarding the standard of hand-writing which may have occasioned errors especially with the less familar surnames. It is to be hoped, however, that few errors will have crept into this transcript.